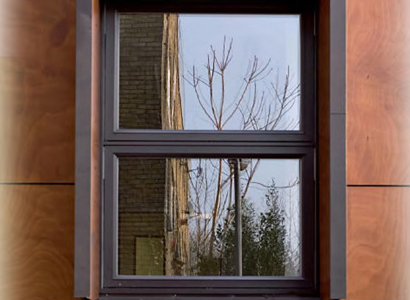 Parklex has developed a wide range of outstanding panels for external use, produced from natural wood. All go through a manufacturing process that provides the natural wood with extraordinary properties of climatic resistance and durability, making Parklex Facade ideal for use on building exteriors. Rain, sun, cold or heat, Parklex covers building façades with natural timber, providing a guarantee of high performance and low maintenance. Don't just settle for using wood on the inside of your building, encapsulate the structure with the natural beauty of Parklex Facade. Due to production and transportation costs associated with this product it is only available for projects 100sqm plus. Parklex Facade is a high-density timber faced panel, manufactured with a core of paper fibres treated with thermosetting resins. These are compressed at a high temperature and pressure and protected by an exterior coating highly resistant to UV radiation and weathering. 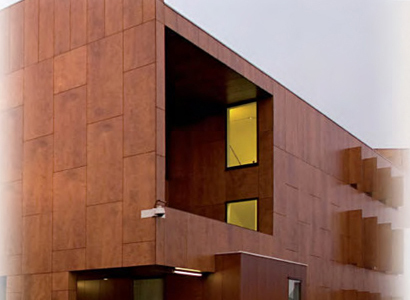 Parklex Facade panels include Everlook ®, a component introduced into the wood to provide outstanding life-cycle benefit in terms of colour stability, in all climatic conditions. It also allows the development of new finishes to our range of timber veneers. Each type of Parklex panel is subjected to differing production processes, depending on the final application: interiors, exteriors, damp environments etc. The starting point is always natural timber veneer and a core of special papers, all treated with thermosetting resins and compressed under high pressure and temperature. The surface is always made from 100% natural wood, treated according to its application: to resist special weather conditions or to perfectly resist the intensive use it might receive in interiors. Perfect integration into the project design is an essential requirement. That's why our patented technology allows for outstanding finishes in natural timber veneer to be introduced into the built environment. Each project is unique, just like the appearance of every Parklex panel. 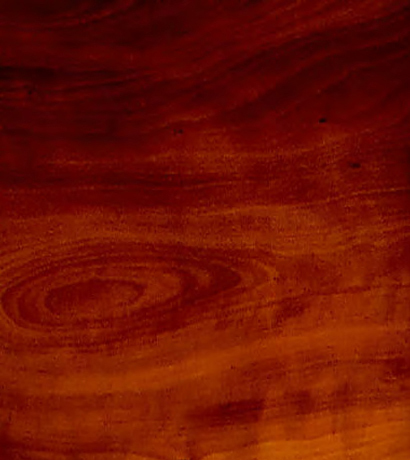 At Parklex we offer a huge variety of finishes and colours manufactured from both natural and pigmented timber veneers. Whatever the requirement, Parklex can satisfy market trends, both current and in the future. Providing service on an international level has meant establishing an extensive network of Parklex distributors on all five continents. This allows us to work more closely with our clients and offer outstanding service at a local level. It also allows us to understand the varying technical requirements in each market. Rigorous testing guarantees Parklex's excellent performance. Global names in architecture specify Parklex for use on their most high profile projects. Why? Because they have confidence in our products and understand the technical and aesthetic benefits offered. The result often exceeds expectation. At Parklex, we have been working for over 15 years on a daily basis with architects from all over the world, including, for example, Santiago Calatrava, Frank Gehry, Norman Foster, Jean Nouvel and Nicholas Grimshaw, adapting our range to their requirements. Our extensive experience has made Parklex the natural wood covering of choice for landmark buildings throughout the world. Our brand is synonymous with the guarantee of high quality materials adapted to the needs and expectations of our clients. Refer to our technical guidance notes for problem free installations. Parklex Facade includes Everlook ® , a special overlay that dramatically increases the normal life of the panel, improving UV resistance and colour stability. It also allows for the development of new panels with an extensive range of finishes. Reveals the simple, natural beauty of the real timber veneer from which the panel is manufactured. Parklex is successfully installed in a wide range of climatic environments throughout the world. Our extensive manufacturing experience and commitment to R & D has allowed us to develop a unique timber building material able to withstand the harshest weather conditions. In addition, our process provides timber panels for use in the aggressive environments created in and around swimming pools, spas and shower rooms. One of the enhanced features of the new Facade panel is its high resistance to UV degradation, sunlight being the harshest natural element. As a progressive company, at Parklex we constantly thrive to deliver superior performance by way of advanced manufacturing techniques in panel production. Our materials offer the highest level of colour stability possible, whilst maintaining the beauty and variations found with natural timber. It is an unfortunate fact of life that many of the best architectural projects have their appearance marred by the random application of graffiti, often applied with cellulose based spray paints. The surface of Parklex Facade has been specifically designed to ensure the simple removal of graffiti, without damage to the panel characteristics or appearance. In addition, Parklex Facade resists soiling by airborne pollutants, and requires a very low frequency of general cleaning. Both important factors when considering the ongoing cost of building maintenance. At Parklex we don't settle for simply complying with the necessary regulations. We strive to produce materials which far exceed the performance requirements laid down in the European Regulation EN 438-6-2005. This norm specifies a result after Artificial Weather Conditions Resistance Tests of 3000 hours. After extensive development, Parklex Facade has achieved a result for most finishes of more than twice the published requirement. As leaders in our field, we don't just comply with regulations, we exceed them. Which is exactly what our clients expect. Unlike most timber materials, our products do not require sanding, varnishing or oiling to maintain their long term appearance. Cleaning is simple, using liquid ph-neutral solutions with water. Graffiti can be removed with relative ease. Parklex invest heavily in R & D, and also provide direct Technical Support to ensure that any questions concerning installation, certification or standards can be answered. We can also offer advice on the specification of the correct material for any project. Internally, many areas are subject to intensive wear from foot traffic. Our Gureprex ® impregnation process into timber is designed to provide outstanding benefits with regard to resistance from abrasion, moisture, scratching and offers a low maintenance hard surface. Practically, our panels offer far greater dimensional and structural stability than varnished or oiled products. Parklex means quality. Our timber veneers are hand selected to ensure perfection. All products carry the CE mark, and are guaranteed for at least 10 years. Exterior panels are manufactured to the high standards necessary to comply with the stringent requirements of European Standard EN 438, which apply to HPL (high pressure laminate) materials. In fact, in many respects, our panels exceed the standards. Our patented production technology guarantees that every Parklex Facade panel will resist the most extreme weather conditions. Our process protects against snow, rain, sun, humidity and heat. The same manufacturing technology is applied to our internal products to offer exceptional performance in wet areas such as shower enclosures, sauna's and spa's. Our complete product range has been tested to the European Standard EN 13.501-1:2002. The results prove that Parklex achieves the highest performance for organic materials. We also have national specific test data for other international markets. Please contact us for details. Parklex products may be installed in both internal and external environments. They are subject to constant wear from the sun, humidity and abrasion in extreme traffic areas. For this reason, a great deal of effort and investment in R&D is made, ensuring the durability and stability of Parklex coverings. Since 2003, Parklex has implemented the ISO 9001 Quality Management System in order to ensure our products and the excellent service we provide to our clients are consistently delivered. Parklex Facade panels are subjected to rigorous testing both in our in-house R & D Department as well as independent accredited laboratories throughout the world. Our commitment to quality ensures the outstanding performance of our products. 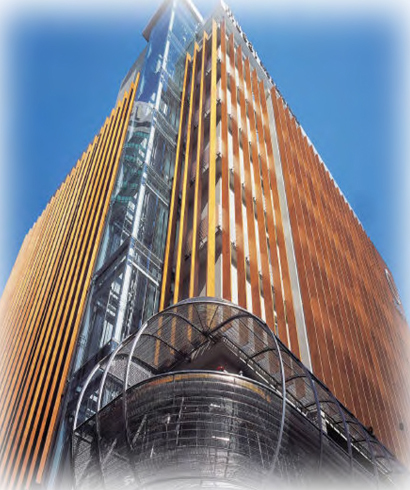 Parklex Facade complies with (and often exceeds) the standards laid down by international certification schemes, including DIT plus (Spain), AVIS Technique (France), Zulassung (Germany), CWCT and BBA (United Kingdom), as well as other national schemes throughout the world. Being acutely aware of the importance of caring for our environment with responsible, sustainable production, Parklex has earned PEFC certification. This prestigious chain-of-custody certification is a guarantee that Parklex is collaborating with the sustainable maintenance and improvement of forests and the environment. With this certification, Parklex is clearly demonstrating a commitment to the responsible acquisition of the raw materials used in our products. We want to work with nature, not compromise it. Furthermore, all technical innovations on new product lines will abide with a philosophy of respect for the environment and sustainable production processes. Parklex is manufactured from wood and wood based materials, therefore the long term protection of this natural resource is fundamental to our business.